Auto accessories such as sun shields, car charger, dice, air fresheners, etc. Gifts for Marine Moms on Mother's Day, Christmas, and other occasions. Shop PINK! in October for Breast Cancer Awareness month. 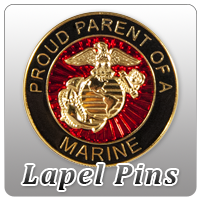 Show your Marine Corps pride with a delicate look! 3/8" lanyard with a metal "J" hook clasp. Soft grey color with "Marine Mom" in pink.